Listen closely to what is said about unemployment--that we've lost three million jobs since January 2009 with the inference that President Obama is at fault since that's when he took office. And our Congresswoman states that jobs is the number one issue. Given her claim that this is such a priority, here is a summary of the legislation she has supported to create jobs. But what about this claim that three million jobs have been lost in the last two years? 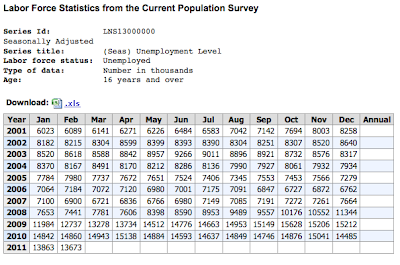 I checked out the U.S. Bureau of Labor Statistics and found the latest unemployment report. You'll notice a couple of things from these charts. 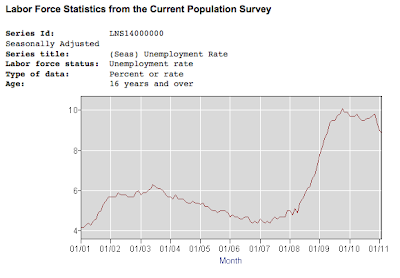 One, the unemployment rate peaked, leveled out, and there's been a slight decline. Secondly, the depiction of job losses shows that taking place and decreasing during the first nine months of 2009. This looks pretty convincing--if you start from January of 2009. It's a convenient starting point, too. Here's an excerpt from our congresswoman's op-ed that was published in several small town newspapers in her district. The spend, borrow, and bailout policies of the past two years have clearly failed. The national unemployment rate has been above 8.5 percent for 24 straight months – the longest streak since the Great Depression - even though President Obama rammed through a $800 billion stimulus bill in a misguided attempt to revive the economy. Looking back at the job losses pictured above, you'll find the losses decreased as the stimulus bill projects put people to work. There was the up and down tick for the census conducted last year. Lastly, we have a modest increase of jobs since. Does she expect the economy to kick into high gear overnight? But let's have a look at the big picture. "Oh, jeeze," as they'd say on Fargo. It appears that some sort of economic disaster struck and brought all this on before Obama was even elected. Wonder what that was. 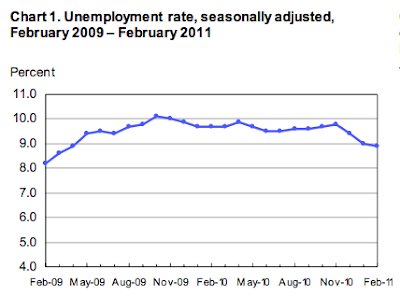 Also notice that the increase in unemployment did not happen overnight. Neither will the decrease. 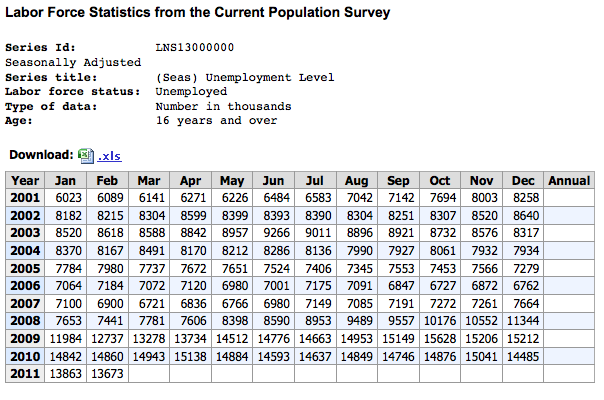 And since we're talking about millions being out of work, here's a chart from the BLS showing those numbers. 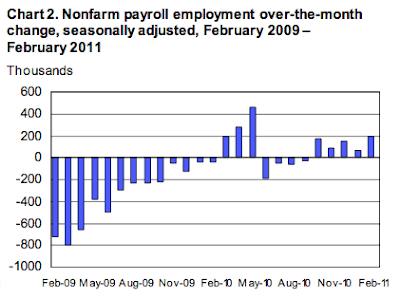 To only consider data from January 2009 and on is disingenuous as best. If you look at what brought it on in the first place, you have a better understanding of the situation. But who needs facts and reality? The best part of this "interview" is when our fair congresswoman is asked specifically what she would cut in the federal budget. She can't answer. She's been harping on this subject for ages now and she can't give one specific. All she can say is that everything is on the table. That's not entirely truthful in itself. Raising taxes is not on the table. Cutting government subsidies for very profitable oil companies is not on the table. I'm sure there is plenty on the table, but she won't say what because...well...that's open to conjecture and I'm finding it difficult to come up with a good reason. It's tough when she just repeats the same ambiguities and catch phrases. So this is the best I can come up with. Congresswoman Cathy McMorris Rodgers feels so strongly about economic responsibility and getting the most bang for the buck, she's looking at the long past expiration date of her talking points and saying, "It's still good."